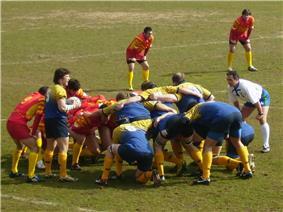 The Catalonia national rugby union team is the national rugby team of Catalonia. It was a founding member of FIRA in 1934, but since 1941 is a former official national team. It is currently trying to be official again. The Catalan Rugby Federation (Catalan: Federació Catalana de Rugbi'), created in 1922, was one of the founder members of the Fédération Internationale de Rugby Amateur (FIRA) in 1934. It played its first match in 1923 against the French club team, Toulouse Lalande Olympique. Its first international match as an official national team was in 1934 against Italy. The teams tied, 5–5, in front of a crowd of more than 15,000 in the Camp de Les Corts. One month later Catalonia played France, losing 15–22. In 1941, after the Spanish Civil War, Spanish dictator Francisco Franco forcibly merged Catalonia's team into the Spanish rugby team. Nowadays some people are trying to reverse this decision, claiming the historical rights as a founder member of the FIRA in 1934. ^ "La selecció a un pas de la remuntada" (in Català). ^ "Katalonien-Sverige 17–21" (in Svenska). ^ "Una festa completa a la Foixarda" (in Català). ^ "Torna Catalunya, el XV de la ginesta" (in Català).